If you are looking in the sky on August 31, 2012 and wondering why the heck the Blue Moon isn't blue...it's because it's a title only. 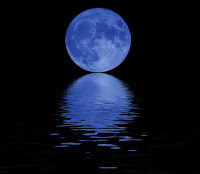 When we have two full moons in one month, the second full moon is referred to as a "Blue Moon". The Sun will be in the practical sign of Virgo,( the sign of service & details, health & routines) with the Moon in the sensitive and dreamy sign of Pisces. What an ideal placement to flow with the lunar tides of what is possible and develop a step by step plan on how to get there! When have you used or heard the saying, "Once in a Blue Moon?" It refers to something that occurs very rarely. 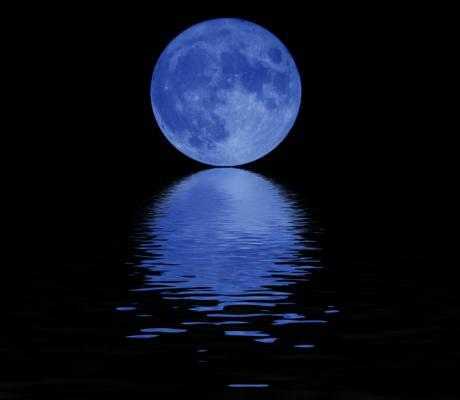 We won't have another Blue Moon until 2013. Why not use this energy to throw out some amazing far reaching intentions! Here is a simple ceremony you could do to align with this energy. First, spend some time dreaming your dream and getting clear. Remember, now is the time to dream big! Take a moment to reflect and ask yourself; "Why do I want what I want? and keep asking "why" to ensure that it really is what you want. Write your desire or intention on a piece of paper. Light a candle (or a fire in a fireplace or firepit) asking for illumination. You could also pray, call in the directions or your Guides,Angels or Ancestors, you could do this now, as well. Ask for discernment and clear sign posts on your path to support your intention. Read your intention out loud. Then crumple it up and blow into it three times. Throw your paper into fireplace or firepit. If using a candle, make sure you place the paper in a fire-proof container after you light it. Observe how it burns. Is it smoldering and slow burning? If so, you may have a few things to move out of the way before you can make your dream happen. Is it catching quickly and almost burning your fingers? Be wary of being hasty in your actions to make this happen...it could be painful. Does it simply catch and burn? Things should unfold in a timely manner. Finally, give thanks and appreciation for the completion of this matter, Great Spirit, God, or whomever you called in for support. This is a really simple ceremony that can be done without much fuss, bells or whistles. What matters most is that you are present and mindful through the process. If you dig this little ceremony...you may want to check out my Moon Magick class. We go over the effects of the Moon phases and astrological implications and how we can use it in ceremony.